A rendering of the Katerra factory coming to Spokane Valley. Employment in the Inland Northwest is booming. Existing businesses are taking advantage of a new federal tax structure to update and expand their facilities, new companies are coming to the region and unemployment has dropped to pre-recession levels, with May 2018 data showing a 5.2 percent unemployment rate. While the details behind one of the largest new facilities to come to the region, Project Rose, remained somewhat secretive for months, Amazon finally announced it is behind the proposed 600,000-square-foot fulfillment building. The massive facility going in near the airport stands to bring between 1,800 and 3,000 jobs along with it. For context, the largest single-site employer in the county is Fairchild Air Force Base, which employs about 6,000 active members and civilians, says Todd Mielke, chief executive officer for Greater Spokane Incorporated. The project was expected to break ground by the end of summer 2018 and be open by late 2019. 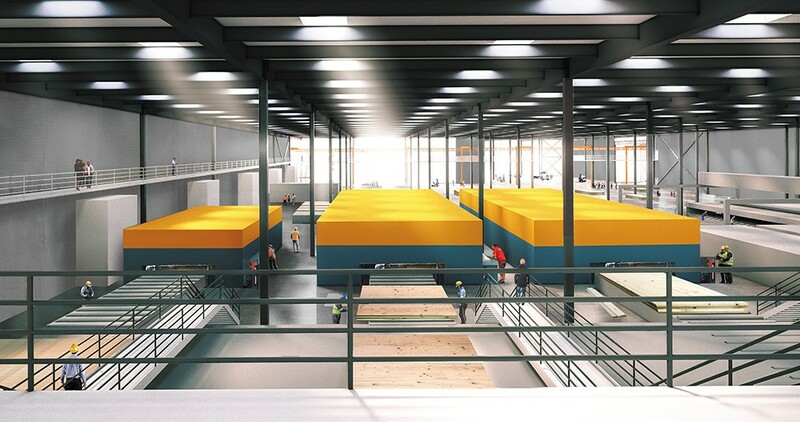 California-based Katerra also started work on a new facility to manufacture cross-laminated timber elements used in its building projects around the world. The innovative wood material allows for less wood to go to waste, and with streamlined parts, can make for faster building projects. The facility is expected to employ about 150. In the industrial park where Katerra is building in northeast Spokane Valley, a few other major manufacturing projects were also close to finalizing their building plans as of mid-July 2018, which could bring even more jobs to that area, Mielke says. And it's not just businesses that are new to the area that are driving change. Partly because there's been a backlog of regular maintenance on facilities that has been put off for maybe 20 years, and partly thanks to increased cash flow from changes Congress made to the tax system in December 2017, businesses here are expanding and reinvesting in their facilities, Mielke says. 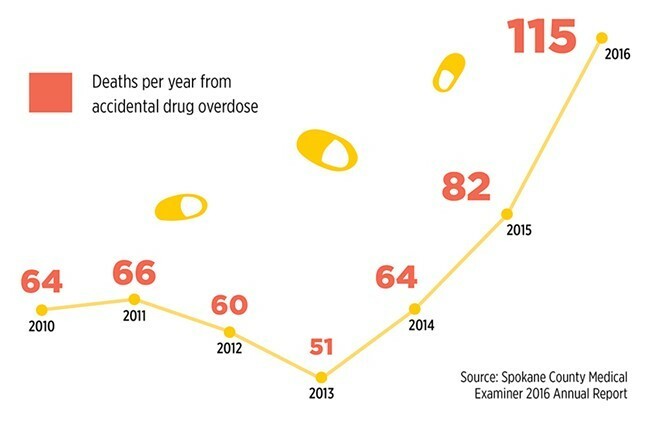 Federal and local data indicates drug overdoses have increased significantly in the last decade. According to the medical examiner's office, most of the death increases have resulted from prescription medications or a combination of illicit and prescription drugs. The data below shows accidental overdoses in Spokane County, in which prescription and/or illicit drugs were demonstrated in toxicology. Getting in to see a dentist in Spokane County can be difficult depending on what type of insurance you have or your ability to pay. "We have very limited access to dentists that will accept Medicaid," says Colleen O'Brien, program manager for the Spokane Regional Health District's Access to Baby and Child Dentistry (ABCD) and oral health programs. But the good news is, newly funded dental clinics aim to change that. With $2 million allocated by the Washington state Legislature, a $2 million grant from Delta Dental and its Arcora Foundation, and support from local health providers, a new six-chair dental clinic is scheduled to open at Providence Sacred Heart by the end of 2018, and another 20-chair CHAS clinic near Providence's Holy Family Hospital in north Spokane will likely open in 2019. The goal is that getting those new chairs up and running, as well as training more dentists through a new residency program, will improve some of the less-than-ideal oral health trends in Spokane County. As it stands now, more than 61 percent of Spokane third graders have already had a cavity, and only about 24 percent of Spokane-area adults on Medicaid went to a dentist in 2016. But through efforts like the Smile Spokane Oral Health Local Impact Network, which works to reduce oral health disparities in the community, ABCD's efforts to get children and babies in to see dentists sooner with an emphasis on prevention, and other educational efforts, there's hope those numbers will improve. "Really what we're finding is that there's some great efforts in oral health right now looking at adults and access to care," O'Brien says. "I think overall Spokane has dentists that are really passionate ... [who] are doing a lot of work in a quiet way to support adults, and I think we're building good infrastructure that can really serve our population." In Spokane County, it's no secret many jobs are tied to the health care industry, but what are the other largest areas of employment? Here, we look at some fast facts on the five largest industry sectors by percentage of total employment in the county and their economic impact on the area in terms of wages paid, according to 2017 data from the Washington State Employment Security Department. 36.7 percent growth: For the three year period of 2014 to 2017, the agriculture, forestry, hunting and fishing job category had a whopping 36.7 percent average annual growth in employment. That's thanks largely to growth in crop production, which went from a monthly average of 402 jobs in 2014 to 1,306 in 2017. The original print version of this article was headlined "Year of Growth"